Spalted alder develops when a log starts to decompose rather than dry. If bark is removed from a log, the log will dry, slowly when the ends are sealed. In this case, the ends were sealed, and the barks was left on for about 8 months. Nicely textured and coloured wood, but a bit more difficult to carve. Like carving cork, crumbling chunks. It was an exercise in consistency, see if I could carve two identical twins. 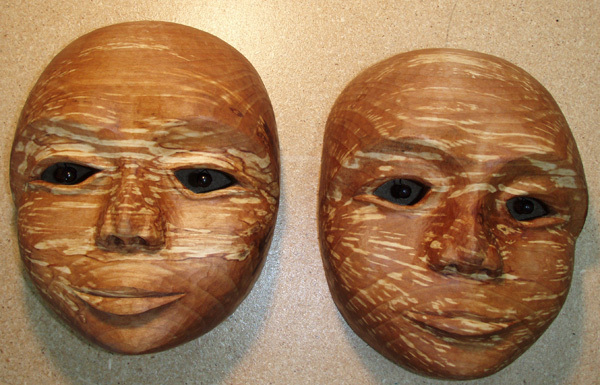 The core of the log runs horizontal in the masks and creates magnetic-like lines radiating away from the ears. Polarity.